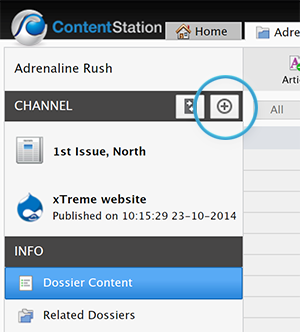 Publishing a post to WordPress is done in Content Station and starts by creating a Dossier. This Dossier will hold the text and/or images that you are going to post and contains the tools for publishing them to WordPress. 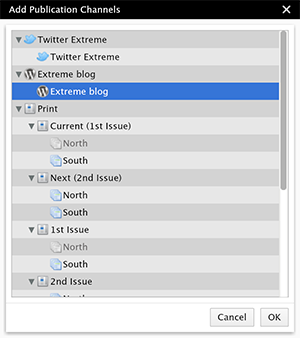 This article describes how to use the tools in the Dossier for publishing a post to WordPress. Step 1. (Optional, only when you are allowed to publish to WordPress) Log in to Content Station by using a user account that has the same name as the name that should appear as the author for the post on WordPress. Step 2. Open the Dossier that represents your story or create a new Dossier. Step 3. In the Channel pane, choose the WordPress Publication Channel to which you want to publish the story. 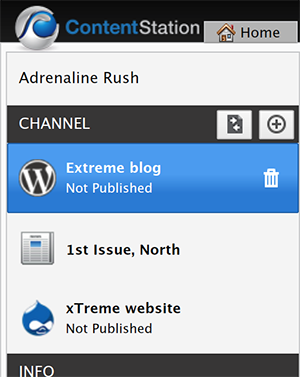 Figure: The WordPress Publication Channel selected in the Channel pane. Note: In case WordPress is not listed, add it first. Step 3a. In the Publication Channel pane, click + Channel. Figure: the + Channel button in the Publication Channel pane. A window showing a list of channels appears. Step 3b. Choose a channel that has been set up for WordPress and click OK. 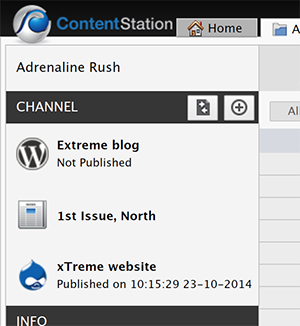 The WordPress Publication Channel is added to the Publication Channel pane. Step 3c. Select the WordPress channel. The Publish Form appears. It guides you through the process of adding all the information and content that is needed to publish the story to WordPress. 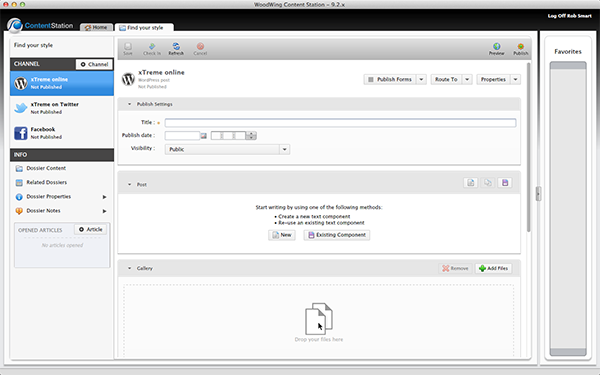 Figure: The Dossier with the WordPress Publish Form loaded, ready to be filled out. Step 4. Fill out the form from top to bottom with all the information and content that you have available. Tip: Periodically save your work by clicking Save. This will store a version of the Publish Form and all its content (except metadata such as the title) to Enterprise. Note: Various ways of using article components exist: you can create a new component, use an existing one or make a copy of an existing one. For more details, see Using article components in a Publish Form in Content Station 9. Step 5. Click Publish to publish the post to WordPress. Why does my name not appear as the author of the post? In such cases, a default name is used instead. When in doubt, contact your system administrator. For more information, see Using WordPress user names as the author when publishing from Enterprise. This is most likely to do with insufficient permissions on folders in WordPress. For more information, see Unable to upload images when publishing to WordPress.